We are delighted to announce that we have successfully completed the certification process for compliance with the international standard ISO 27001-2014. MakoLab has fulfilled all requirements of this information security management system certification audit and has received the awarding document from TUV Nord Poland. This certification confirms that the company's performance is in line with the highest international standards, increasing its chances of working with global players in the market. Being awarded ISO 27001 validates and demonstrates that MakoLab has effectively implemented and maintained our Information Security Management System, ensuring that the data of current and potential customers is safe and adequately protected. Customers both require and expect their suppliers to act according to certain security and organisational standards. This certification thus ensures the comfort of our existing and future business partners and means that they can have complete confidence in the information they entrust to us. 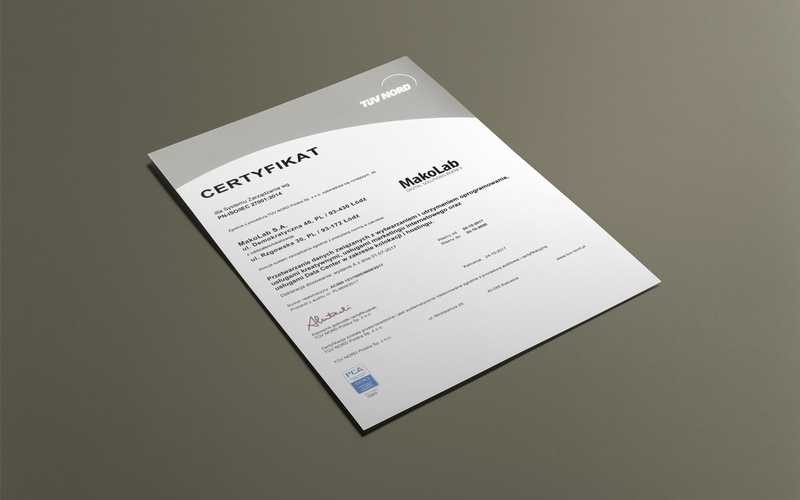 MakoLab has fulfilled a series of requirements in order to obtain this certificate, which have been verified by official auditors from TUV Nord Poland. Getting the certificate shows that we understand the importance of protecting information in an organisation to ensure business continuity, minimise business risk, and maximise return on investment. We are able to meet the most stringent requirements of business partners for whom the fulfillment of specific standards is a prerequisite for starting cooperation. Compliance with recognised global standards, further endorsed by trusted companies, is a must for organisations with a goal towards lasting international development. MakoLab's commitment to providing high-quality, cost-effective IT and marketing services associated to the acquisition of the ISO 27001 certificate marks a key milestone in the company's successful history and future growth. The new opportunities this certification brings will enable Makolab to foster working relationships with global players in the marketplace who necessitate and welcome those with an effective information security management system.